Cape Town – Perhaps Bafana Bafana’s recent inability to find the net will continue in their second Africa Cup of Nations group match against Angola at Moses Mabhida Stadium on Wednesday (17:00). After all, that particular malaise has deepening roots. Maybe they will also grind out another ho-hum goalless draw ... and if the later game on the Durban double-header bill between Morocco and Cape Verde Islands similarly features yet another stalemate, Group A will genuinely develop into a quartet of particularly grim “death” ahead of Sunday’s final fixtures. Considering the thick fog of uncertainty and consternation over our much-maligned and just as often ridiculed national soccer team, heck, this particular group going right to the wire might not be such a bad thing? After all, just reaching the knockout phase will be a source of great relief, even if it all comes down to a nail-biting, lottery-type environment to squeeze Bafana through. Of course a wretchedly untimely, maiden defeat to the Angolans on Wednesday will leave South Africa on a knife edge, so that is the one result the vast majority of an anticipated crowd of over 55 000 will be praying does not materialise. But if they are to slug out the very minimum requirement, you would imagine, of a point, I can think of plenty of compatriots who will be fervently wishing one key, soul-lifting thing as an accompaniment: a performance that at least contains some semblance of zip and urgency. These were qualities so abjectly lacking in the AFCON opener -- an insufferable spectacle for all who watched it worldwide and a dreadful early-tourney advertisement, frankly, for African football. The subsequent buzzword around the Bafana camp is that the team inexplicably “froze” through a collective fit of nerves. Froze? As host nation? Against a collection of 10 remote islands wholly uninhabited before the 15th Century when Portuguese maritime explorers first set foot on them? It seems a strange affliction, especially when you consider that in Gordon Igesund’s first match as head coach, South Africa had a rip-roaring go at the most iconic soccer nation of all, Brazil, in their presumably rather imposing Sao Paulo stronghold. Yes, as recently as the southern hemisphere spring, remember, Bafana kept the Brazilians, featuring many seriously heavyweight names, at bay for 74 minutes in an up-tempo international friendly, before succumbing by a 1-0 score-line and earning rightful, widespread plaudits for their tenacity and no lack of technical competence, either. Though it may seem a trifle bizarre to say it, I would argue that the next best performance by the national side in the Igesund era may well have been another 1-0 outcome against Bafana – the much more recent game against Norway at Cape Town Stadium. Spurred on by vibrant, atmospheric support in a city they seldom grace, South Africa’s big redeeming quality -- on a night where the scoreboard served as the only, infuriating signal to the contrary – was the extent to which they monopolised possession and territory and created both constructive space and a steady stream of scoring opportunities. Against Cape Verde, by significant contrast, there was just no life, ambition or general acumen about Bafana at all. The match as a whole was straight out of Palookaville: I have seen better gusto and positional shape out of a bunch of over-45s fuelled predominantly by hangovers on a Sunday morning club pitch. The teams were as inept as each other for the most part, only dragging each other down into the spiral of torpor. How unedifying it was to see Bafana players riddled with doubt while on the ball, before sloppily surrendered it to the opposition through wayward or occasionally crazily overcooked passing. How galling to see corner kicks only delivered innocuously into touch beyond the far post, way out of reach of head or goalkeeping hand. How demoralising to see inexplicably panicked South African defenders fly-hacking the ball somewhere ... anywhere! There are knockers out there who, sometimes for their own often slightly twisted or bigoted reasons, seek only to belittle Bafana Bafana: boy, were their agendas aided. Plenty of us are more temperate, reasonable, and hopeful – because we have, indeed, seen them show mettle, show panache (even if too often inconsistently within specific matches). Honour, desire and pure willingness to actually “play” some football, remain important, comforting devices, even in times of relative adversity. 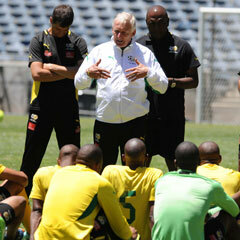 Bafana would do well to remember that as they prepare for second-match battle at AFCON 2013. They have served up successive, veritable snore-fests over the past few days -- pre-tourney against Algeria and then so depressingly when the optimists among us figured they would just naturally lift a notch for the much-hyped Cape Verde opening fixture. Please, Bafana, give us something to grab onto, won’t you?